The battle for Long Thanh (April, 1975), initiated by 325th Division, was an extremely hard-fought battle due to the substantial strength and firepower of the opposing Army of the Republic of Vietnam (ARVN) defending force. However, thanks to the comprehensive mobilization of various fighting forces and elements, 325th Division was able to accomplish its objective, managing to make a critical breach in the ARVN’s outer defense perimeter, allowing our main forces to approach and liberate Saigon. After numerous defeats in Central Highland and Central Vietnam, the enemy decided to use their remaining forces to set up defense perimeters around Saigon, including Long Thanh – Nhon Trach – Long Binh line, which served as an obstacle to halt our attacks to South East and South West of the capital city. The enemy forces in Long Thanh consisted of 933rd Security Inter-battalion, 468th Marine Brigade, a 105 howitzer battalion, etc; besides, they also received additional air and artillery support during the course of battle. In regards to our forces, after fighting alongside friendly units and local armed forces, 325th Division, operating in the formation of 2nd Corp, arrived at Ong Que Plantation, Dong Nai on April 20th, 1975. On April 23rd 1975, 2nd Corp Command ordered the division to deploy on its left flank to perform flanking maneuver in the upcoming Ho Chi Minh Campaign. The initial objective of 325th Division was eliminating enemy forces on the left bank of Dong Nai River, liberating Binh Son, Long Thanh, Nhon Trach Military Subdistrict, Tuy Ha Fort, and escorting 2nd Corps’ artillery force to Nhon Trach to suppress Tan Son Nhat Airfield. The subsequent task was crossing Dong Nai River to capture Cat Lai Naval Base, then launching a pincer attack to sweep through District 9 and 4 from the East. The ultimate goal of the division was the Independence Palace. In this plan, 101st Regiment was assigned as the primary force to liberate Long Thanh. The Battle for Long Thanh lasted from April 26th to April 28th, 1975. Initially, the ARVN defending force had the advantage of well-prepared entrenchment and air and artillery support, thus making the battle become extremely brutal. Especially, they constantly launched counterattack skirmishes, causing a lot of difficulties and casualties on our side. Under this circumstance, 325th Division command managed to fully utilize all resources and closely coordinate available forces to create a tremendous fighting power. As a result, the enemy eventually had to suffer devastating casualties, including 450 troops killed, 500 troops captured, nearly 1000 troops fled from battlefield, 2 artillery batteries destroyed, 10 105mm howitzers and many other weapons and military assets captured. This success allowed us to make a crucial breach in the enemy’s outer defense perimeter, enabling the division to set up a river crossing to capture Cat Lai Naval Base and march toward Saigon; while securing our left flank and allowing 304th Division and other units participating in Ho Chi Minh Campaign to accelerate their offensive pace. 1. Promote political will, fighting spirit, gallantry in battle and the determination to overcome all difficulties and the willingness to make sacrifice for national liberation among the division’s soldiers and officers. In the preparation phase, 325th Division Command and Party Committee issued instructions and orders to all levels to educate their subordinates to fully understand that our offensive momentum was unstoppable; and the enemy was in a dire situation, their defeat was inevitable. To that end, soldiers of the division were encouraged to promote fighting spirit and gallantry in battle to ensure our victory. Although the enemy had to maintain a passive stance and face the threat of being completely destroyed, they still had a substantial strength, well-prepared entrenchment and considerable firepower from artillery and air support. Against this backdrop, the division’s officers and Party members further advanced their role in rallying soldiers in combat and became shining examples of valor in the midst of battle. 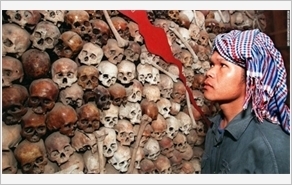 Lest we forget, in this battle, there were 195 comrades made the ultimate sacrifice; many of them were officers such as: Battalion Commander Nguyen Anh Duong, Battalion Political Commissar Nguyen Van Da, etc. Those examples had greatly boosted the fighting spirit and combat morale among their men. This sheer was the continuation of our national heroic tradition in defiance against foreign invaders for thousands of years; and the result of our Party’s precise and adept political policies and the dearest wish in the heart of each soldier and officer about national liberation, peace and reunification. These factors were highly promoted by the division’s members and became an overwhelming momentum to win the battle. 2. Fully employ the strength of combined arms during the course of battle. The battle for Long Thanh was won by the combined strength of 101st, 18th, 46th Infantry Regiments, 85th Artillery Regiment and its subordinate units; the division was also supported by attachment units from 2nd Corps, including 1 artillery battalion, 1 anti-air gun battalion, 1 tank company, etc. With this powerful force, 325th Division Command heavily focused on planning battle coordination to maximize its strength in the fighting. On the other hand, because the division fought under the formation of 2nd Corps and Ho Chi Minh Campaign, its battle plan must be compatible with the general plan of the corps and the campaign, avoiding any delay in the overall offensive schedule. Ho Chi Minh campaign was officially launched at 1700 hours on April 26, 1975 with the preparation artillery fire striking on designated targets. In the area of operation of 2nd Corps and 325th Division, 130mm field guns, 122mm and 105 mm howitzers, rockets and mortars fired for effect against targets in Long Thanh, Nhon Trach Military Subdistrict, Binh Son, etc. After the preparation fire, tank and infantry units from all directions simultaneously pushed forward to their given objectives. The battle for Long Thanh was extremely intense and violent due to the fact that the enemy put up a fierce resistance from heavily fortified positions. Given the circumstance, 325th Division Command adjusted its battle plan, used 18th and 46th Regiments to strengthen attacks on enemy flanks and ordered tanks from Phu My to maneuver via Route 15 to reinforce the main spearhead and collaborate with artillery to destroy enemy forces one by one to minimize our casualty. Thanks to this excellent coordination plan, the strength of combined arms was fully employed to win the battle. 3. Fully employ the close coordination between main forces and local armed forces and the people of Long Thanh. 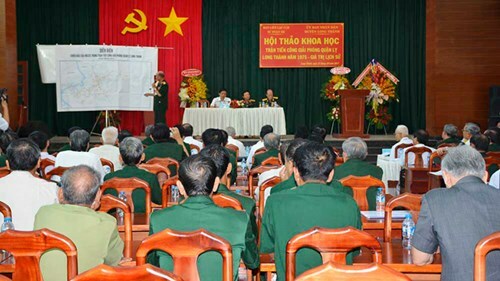 During the battle, the Party Committee, local authority and people of Long Thanh donated 128 tons of rice and a large amount of medical supplies. Also, guerilla units and over 100 civilians worked with men from 325th Division to repair Route 10 and 15B, construct entrenchment and artillery batteries, and assisted in reconnaissance activities on enemy positions. In battle, when 101st Regiment initiated the attack on Long Thanh, Long Thanh local company, Rubber Plantation company, guerilla units in Phuoc Nguyen, An Loi, Tam An commune also conducted coordination attacks, laid siege to local puppet authority offices, searched for enemy collaborators and called enemy troops to surrender. On Route 25, Phuoc Thien commune guerillas launched attack on Ben Cam military post, 240th Bien Hoa local battalion fought alongside 46th Regiment to capture Nhon Trach Military Subdistrict. Especially, after the liberation of Long Thanh, the local Party committee and authority mobilized hundreds of ships and boats to transport our troops crossing Dong Nai River to capture Cat Lai Naval Base. The perfect coordination between 325th Division and local people and armed forces trapped the enemy in our encirclement, isolated them and forced them to defend in every direction at all times, and eventually suffer a total defeat. The battle for Long Thanh in Ho Chi Minh Campaign provided many invaluable lessons, including experiences in concentrating various strengths to accomplish combat missions. They are the power of political will, determination, fighting spirit and the willingness to sacrifice for national liberation of 325th Division members as well as the power of combined arms and the power of people warfare. Nowadays, there have been many new developments in the task of national defense; however, the lesson of employing the overall strength of available elements in the Battle for Long Thanh in the General Offensive and Uprising Spring 1975 remains very valuable. Follow the example of its predecessors, today generation of 325th Division must continue to promote political will and fighting spirit and further training to improve its combat capabilities and weapon and equipment proficiency to enhance the ability to fulfill any missions in any scenario.